Chips are carrier foods--they are a great vehicle to transport other items into your mouth. Trader Joe's Veggie & Flaxseed Tortilla Chips are like the BMW and Porsche class of carrier foods. They will not only transport whatever dip your dippin' that day, but they also fuel up your tank with some fiber and Omegas. And who doesn't love those? 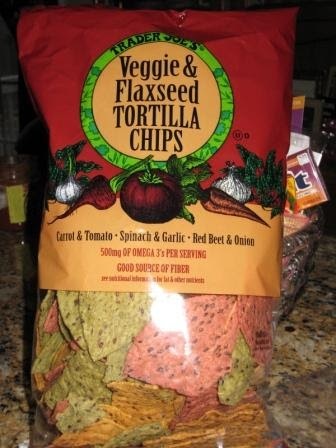 So next time you dip your chip, make sure you dip in healthy-style and grab a bag of these colorful, crunchy, fiber, flaxseed chips. Call me skinny, but these chips definitely DGAF about what a normal chip should look or taste like, and that's a good thing. These are awesome carriers of dip, cheese, salsa, and almost anything else you can pile on top of them. They're strong enough not to break off in a treacherously thick onion dip but still quite tasty to munch on their own. I can't go back to the boring old tortilla chips after having been spoiled on these bad boys! These chips sound great - providing you with Omega 3's and also fiber! Look forward to trying and thanks for sharing. These chips taste great and are clearly very good for you. However, I have SEVERE gas & bloating after eating them--and by "severe" I mean I was so completely incapacitated that I had to lay down and munch on Rolaids for TWO HOURS before I approached anything akin to comfortable again. In fact, I couldn't even go get the Rolaids myself since that would have involved the ability to stand up straight and I couldn't, and instead I had to call my neighbor for some (he had a good laugh, and now you can too). Since then, I eat them very sparingly, and they STILL produce marked gas & bloating, albeit to a lesser extent. However, I dare not eat even Lilliputian amounts if I have to make any appearance in society whatsoever. I eat pretty healthy most of the time, but I have NEVER felt such pain as a result of tortilla chips--or any other foodstuff, healthy or otherwise, including beans--In. My. Entire. Life. I just had these today and oh my goodness, I had extreme gas! I know exactly how you felt. I don't even want to go anywhere near them anymore. You and your other poop buddy are freakin weird. TMI ! Thank you for the play by play of your bloating and cramps. I will be sure to keep that in mind next time I think of gifts for people that are on my 'im only nice to you bc we have mutual friends' list. Of course I will not give them rolaids w/ the bag of chips, but it is something to consider granted they will not immediately see a connection, and then later, upon eating the chips, realize that i knew it would force them into a fetal position accompanied by painful and uncanny bloating and gas. At that point, they would then realize I had planned their pain and they would be extremely angry, but unable to take vengeance as they are debilitated. Later, when the pain has passed they will still take no vengeance as my plan was so intricate and planned out it will force them to resign as they can not beat me. This is all contingent on the fact that they react to the chips in a manner similar to you. I had no such experience. Best of luck. Eating cereal too fast and gulping air with it. This the best comment page EVER! Haha, Just read these comments and some of them are a crack up! I bring in a bag of these chips to work pretty often, and no one has complained of gas yet. (Maybe they just don't want to admit it ;). However, these chips are mighty tasty. Once you pop, you can't stop! Hi Rachel-- yes there is corn in the chips! Can someone tell me how these puppies are made? ie. Are they deep fried like regular tortilla chips? a Karisian GZ-7 alien laser assault rifle, or potentially some sort of fire roasting or pan frying. packaging - so slow roasting seems unlikely. there is just something about this chips that make them seem healthier than the average Joe. Oh no, I have a date tonight. Should've read these comments before I ate half the bag. I can either cancel the date or hope he has a really good sense of humor and a bad sense of smell. I know the original posts are several years old but I just have to post that I am in severe abdominal distress after eating these. Not just bloating and gas, but cramps too. I looked up flaxseed and it says you are not supposed to eat whole flaxseed because it cannot be digested. Oh great, now I find out. The chips have whole flaxseeds in them. Just wanted to record this in case anyone is having severe cramps and gas and thinks, "Hmm, could it be the chips i just ate?"